Breakfast is by far the greatest meal of the day (in my humble opinion, of course). Many assume pancakes are not a “health food," but I’ve found quite the opposite: you just need to find the right mix—or make them from scratch, if you have the time. Breakfast is by far the greatest meal of the day (in my humble opinion, of course), and if you’re like me, you can’t resist a good pancake, topped with fresh berries. Many assume pancakes are not a “health food," but I’ve found quite the opposite: you just need to find the right mix—or make them from scratch, if you have the time. I’ve spent a few weekends (because isn’t that when you want pancakes, most? ), testing out mixes. Below, my findings. If you’re in the mood for a traditional pancake, go for Kodiak Cakes Frontier Flapjack Whole Wheat Oat and Honey Mix. Two 4-inch pancakes add up to a mere 130 calories and provide you with 7 grams of protein. Plus its 4 grams of fiber will keep you energized for the day ahead. Also, for those who are diabetic or on sugar patrol, don’t fear—a serving has only 2 grams of sugar! Also, I am not a maple syrup fan, so I was ecstatic they make a marionberry syrup. 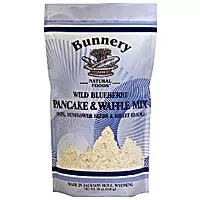 For a flavored mix, if you want a little extra sweetness, I'm absolutely crazy about Bunnery Natural Foods Pancake Mixes! Their O.S.M. base, as they call it (oats, sunflower seeds, and millet), has some great perks: sunflower seeds are abundant in vitamin E, B, and magnesium, and millet may lower cholesterol and risk for type 2 diabetes. I highly recommend their Wild Blueberry Pancake and Waffle Mix. The texture is fluffy, with a potent hit of blueberries. Also, 2 ounces of mix is only 190 calories and provides 6 grams of protein. Want a pancake for dessert? Try theiqr Double Chocolate Pancake & Waffle Mix with some berries and whipped cream—the chocolate bits just burst in your mouth! 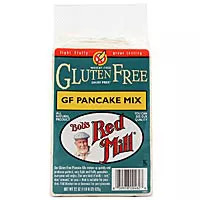 For all those gluten-free fans out there, I suggest Bob’s Red Mill Gluten Free Pancake Mix. This tasty and light mix is only 140 calories for a serving of two 4-inch pancakes, and has a mere 0.5 grams of fat! And try pairing your pancakes with some apples and cinnamon—the fiber and crunchiness in apples keeps you full to lower your overall calorie consumption, and cinnamon can power up your metabolism.